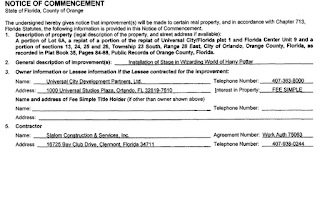 Today, Universal filed a building permit with the City of Orlando for a job trailer for Project 971 which is for the Simpson's land. This indicates that the project is likely to get underway pretty soon. The post Potter/Comcast era dedication to quality and maintenance continues as the Brickworks facade near Disaster is about to get re-bricked. Slalom Construction will doing the work. Lastly, Hollywood Rip Ride Rockit is getting a new steel pass through tunnel. Coastal Steel, Inc. is doing the work. As always follow @Parkscope and @CaptMichael87 on Twitter for your theme park news and like us on Facebook. #HASTA! This past August I had the chance to do my first 'proper' Universal Orlando visit. I've been to Universal Orlando several times, either as an addition to a WDW trip or while staying at friend's houses. Neither offered the 'get up for gate opening, stay, see the nighttime show, leave' rhythm you acquire after a day or two on a normal WDW vacation. But this time was different, as I stayed an extra two days around the corner from Universal on I-Drive, and exclusively visited those parks. 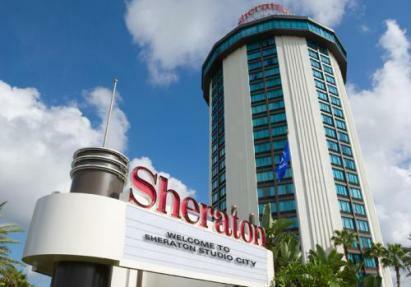 When Joe stays in Orlando, he stays in the Four Points by Sheraton near Orlando. With Disney on a tick-tock cycle of additions and Universal still working on its Potter 2.0 expansion (remember, this was before Transformers was green lit), Universal took the chance to flesh out the parks experience even more. The "Year to be Here" promotion got locals back to the parks and kept the tourists locked inside the resort longer. 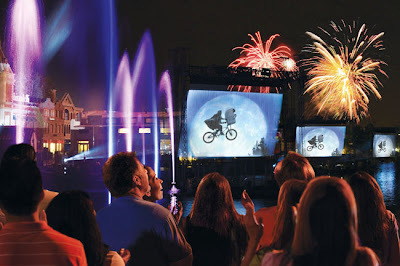 Of the offerings, the new Universal Studios lagoon show, "Universal Cinematic Spectacular", piqued the interests of the fan community the most. It's no secret that Universal has had a, *ahem*, hard time bringing a lagoon show to life. So when the domes were deflated and water screens were hoisted, the same old Universal Creative question came up: can they create an atmosphere and theme without a story? Yes, Universal has created a nighttime show that acts as a night cap and lives up to it's name. The show whisks guests through the vast catalogue of Universal movies by focusing on the various genres that move and inspire us. The water fall screens act as the main focus as Morgan Freeman narrates our journey. The fountains and spray screens fill in the lagoon with color and movement while fireworks accent moments and action on the screen. 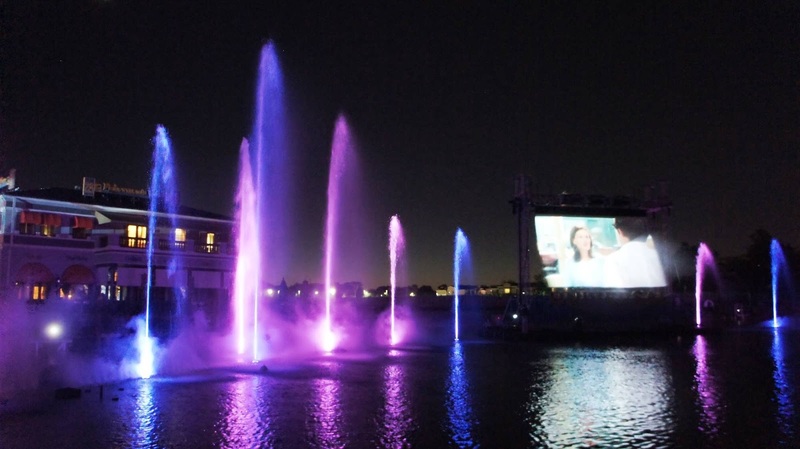 Cinematic Spectacular embraces the best qualities of movies and how they affect us. After just one showing I was already lining my Netflix queue. Cinematic Spectacular works because it has an anti-plot; there is no story beyond collected themed presentations. There is no Mickey battling evil, the creation of the world, or kid's dreams. It's movies, fireworks, and water. The most hyped part of the show, the fountains, are the lowest focus of the show. The unique water droplet curtains aren't used to much effect beyond the preshow, and the fountains just go up, down, and sway. This is odd, as concept art and announcement hype compared this to "Universal World of Color", and even some internet personalities (*shivers*) dubbed it "UniColor". Believe it or not, it's more impressive in person. 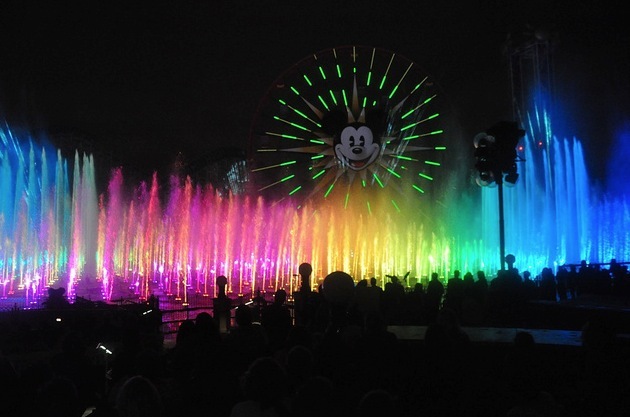 People naturally compare it to World of Color, a known entity. Something from across the country, a show many have not seen. Today, Universal Orlando Resort put out a teaser and a countdown clock that will end November 1st 2012 at 7:30 PM EST. But what will they be announcing? 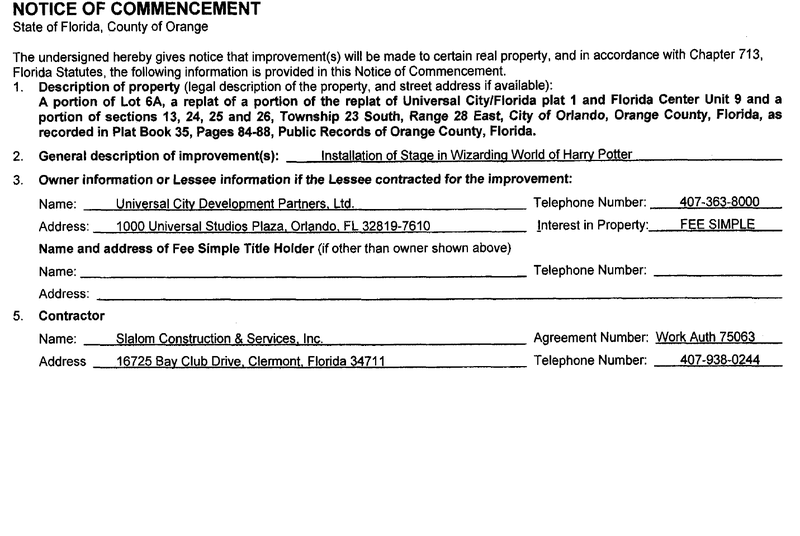 So far there are two large construction projects going on, one being Transformers, the other the second phase of the Wizarding World of Harry Potter. Well, an intrepid young sleuth over at Orlando United has found that the coding of the countdown clock is titled "TransformersCountdown". So that settles that, true believers. 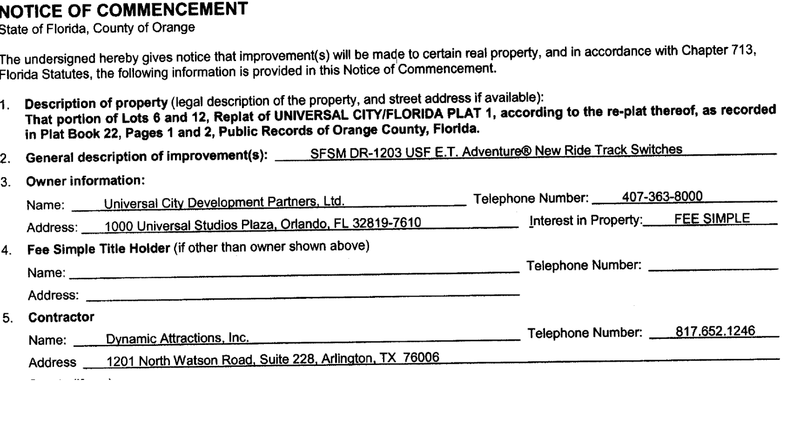 We'll finally be getting confirmation that Transformers the Ride will be coming to Universal Orlando Resort! And hopefully, that won't be all we're hearing about! 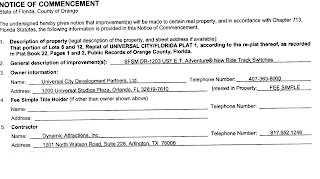 Universal filed a new Notice of Commencement today for the ET Adventure with Dynamic Attractions INC for new ride track switches. The notice of commencement can be seen below, as well as a link to the document. Obviously, it is unknown at this time whether the track upgrades/maintenance will require the closure of the ride, or whether the work will be done during third shift, but follow @Parkscope for up to the minute updates. The Notice of Commencement expires at the end of the year, so if there is a closure we should know about it soon. Here's to hoping an old classic will receive the attention it deserves!